Excellent credit (740-850) means excellent rewards. Browse the best excellent credit offers from our partners with lower rates, better introductory offers, and exclusive perks. Find your perfect match and apply simply and securely. 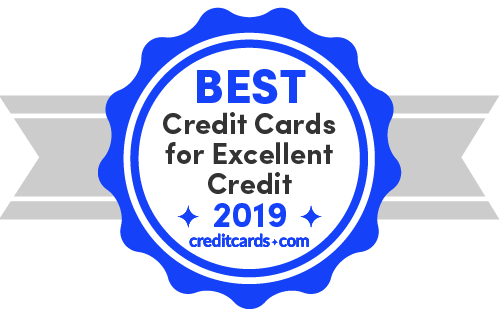 For even more options be sure to check out the best credit cards of 2019 from our partners. See best credit card offers for people with excellent credit from our partners below. What determines an excellent credit score? Why should I aim for excellent credit over good credit? What should I look for in a credit card if I have excellent credit? How many people have excellent credit? We'll walk you through each step of the process for deciding the best credit card for you in the excellent credit range. Let us know what other questions you have! Applicants with excellent credit are eligible for top credit card offers from issuers like Capital One, Chase, and American Express. With flat-rate cash back that includes an elevated 3% on up to $20,000 in purchases in the first year (then 1.5% cash back on subsequent purchases), the Freedom Unlimited is a good set-it-and-forget it card. It may not have the sign-up bonus of the Wells Fargo Cash Wise or the tiered rewards of the Blue Cash Everyday, but this card is a good card for earning rewards without having to think about spending. Bottom line – Among flat-rate rewards cards, the CFU is one of a kind, thanks to its high cash back in the first year. This card has a bit of a twist with no sign-up bonus, but double your cash back. Here's how it works: Earn 5% back on rotating categories ranging from restaurants to wholesale clubs and more. Then at the end of your first year, earn double your cash back. With this offer, you could earn up to $300 a year (with a spend of up to $1,500 a quarter on rotating categories after activating), then another $300 at year-end. There's no annual fee, so this cash back is free and clear provided you pay in full each month. Bottom line – This card is especially worthwhile for frequent online shoppers, as Amazon.com has been featured in the past as a 5% bonus category in Q4. Excellent credit has its rewards – in more ways than one. For example, you can earn 10% back on up to 100,000 points redeemed and get your rewards rounded up to the nearest 10 points on every purchase. You can also earn 15,000 points after a $1,000 spend within the first 3 months; earn 2X points at supermarkets and gas stations up to a $6,000 spend each year; then, earn 1X point after that and on all other purchases. Bottom line – The Citi Rewards+ is a great all-around rewards card for the consumer who wants to avoid a hefty annual fee and wants to earn points in myriad ways. A tiered card for the world traveler, the Sapphire Preferred offers 2X points on worldwide travel and restaurants in addition to its 60,000-point sign-up bonus after a $4,000 spend within 3 months of account opening. Undoubtedly, this large bonus is one of the best things about the CSP. Bottom line – Although it has a $95 annual fee, this card gives a generous boost of 25% on rewards when redeemed for travel at Chase Ultimate Rewards. However, other spending is only 1X point per dollar, so you might want to weigh whether the Venture Rewards is a better choice. A straightforward card with a simple rewards structure, the Quicksilver from Capital One frees you up from having to keep track of rotating categories and the such. Instead, just use this card to get 1.5% cash back on every purchase. There's no annual fee, and no foreign transaction fee means it's good to use worldwide. Bottom line – The Quicksilver is a great card to earn consistent, unlimited cash rewards. This card's greatest strength is the 0% intro offer – 18 billing cycles for purchases and for any balance transfers made in the first 60 days. It's 15.24%-25.24% variable after that. Bottom line: Although there are no sign-up bonus or ongoing rewards, this card is one of the best among the 0% intro offer cards. With a 50,000-point sign-up (after $4,000 spend within the first 3 months) and 3X points on travel, including gas stations, this card keeps surprising with 2X points on entertainment and at restaurants. Bottom line: Although not unusual for a travel card, this product has no 0% intro offer on balance transfers or purchases. However, the sign-up bonus and rewards are more than competitive. This card offers a $150 sign-up bonus after a $500 spend within the first 3 months, 3% back on dining and entertainment, and 2% back at grocery stores. These features allow it to compete well with similar cash back cards. Bottom line – If you are looking for a solid intro bonus with rewards for the long haul, the SavorOne is an excellent choice. This card offers a combination of 5% back for 2 select, unique categories and 2% back on your choice of everyday categories, such as groceries and gas. There's also the sign-up bonus of $150 after a $500 spend within the first 90 days of card membership. You can also get 0% intro APR for 12 months on balance transfers (it's 16.24%-25.24% variable after that). Bottom line – To play the rewards game to its fullest, try the U.S. Bank Cash+ Visa Signature. It combines the rewards structure of the Bank of America Cash Rewards with that of the Chase Freedom. Earn 50,000 miles after a $3,000 spend within the first 3 months of card membership and 2X miles on all purchases. Also, earn 10X miles when booking at hotels.com/venture. Bottom line – New with the Venture Rewards, you can transfer your miles to more than 12 travel partners, making this card that much more valuable to the traveler in search of flexibility. Making payments on time is the most important aspect of a credit score. This portion of your score factors in the frequency of late or missed payments and the length of each delinquency. The more severe, recent and frequent your late payments, the larger the impact on your score. You need to be scrupulous about paying your bills by the due date if you want to push your score into the excellent range – your credit history should show no recent late payments. Negative information can stay on your credit report for seven years, although the older the information, the less of an impact. That means that even if you slip up, by correcting your behavior, you will see your score rise again soon after a drop. The amount of credit that you are currently using is the next greatest factor in your credit score. Lenders look at the total amount that you owe on each of your accounts compared to your credit limit, and the total that you owe overall compared to your overall credit limit. Revolving debt, including credit cards, is an especially important consideration in this portion of your score. The general guideline is to keep your revolving balances under 30 percent of your available credit limit. The lower, the better. The age of your accounts is a less important, but still significant factor in your score. This portion of the score factors in the age of your oldest account, the average age of your accounts and the age of specific types of accounts such as credit card accounts, car loans and mortgages. To achieve an excellent score, you need to be especially careful about shutting down long-standing accounts, and you shouldn’t open too many new accounts at once, since this can drag down the average age of your accounts. The types of accounts under your name (also referred to as your "credit mix") get a smaller amount of weighting in your score. FICO and VantageScore give higher scores to consumers who have a diversity of credit, including revolving credit, such as credit cards, and installment loans such as mortgages. To get your score into excellent range, you should make sure you have multiple types of credit in your credit history. Your number of recent credit inquiries is a small factor in both your FICO score and VantageScore. You should be careful about applying for new credit cards. Make sure you can qualify before you apply and try not to apply for a lot of cards all at once, as this can cause your score to drop. Note, this part of the score only looks at “hard inquiries” on your credit report. “Soft” inquiries (inquiries you did not initiate by a credit application) do not count. Also, the impact to your score from a hard inquiry tends to be temporary – it usually bounces back quickly. FICO factors in the number of new accounts that you've opened recently as a small part of your score. To nudge your score up, you should be careful not to open too many new accounts in a brief period. The total debt that you owe isn’t nearly as important as how much of your credit you are utilizing, but lenders do look at the total amount that you owe on all your accounts. In general, you should try to minimize your account balances to increase your credit score. For VantageScore specifically, having too much available credit can negatively impact your score. You should avoid taking out more credit than you need, but, you should also weigh this factor against other factors, including credit utilization and account age, which have a much larger impact on your score. Having a lot of available credit also works to improve your credit utilization ratio. Furthermore, older accounts – though you may no longer need them – add to the length of your credit history, so you should think twice before closing them in an attempt to reduce your available credit. At first blush, there may not seem to be much difference between good and excellent credit. But look deeper, and you'll see that it's a difference of interest rates and credit cards that you qualify for. Some cards, such as the U.S. Bank Cash+, only accept excellent credit, so your options open up somewhat when it comes to credit cards. Another reason for wanting an excellent credit score is that lenders will give you the best rates and terms. That's because they deem you to be more credit-worthy when your score is outstanding. Ultimately, the reason for striving for an excellent score, other than bragging rights, is that you can save a significant amount of money, whether you land a lower interest rate on a mortgage or you get a new credit card with a superior sign-up bonus. A credit card’s sign-up bonus is the card issuer’s biggest maneuver for getting your business, and can be one of the most valuable features on the card, worth hundreds of dollars, or even more than $1,000. For a points- or miles-based rewards card, keep an eye out for offers of 50,000 points or more. For cash back cards, you should be able to land a sign-up bonus of at least $150. You will also be offered generous rewards on your ongoing purchases. In today’s market, you should qualify for a card that offers at least at an average of 1.5% back on every dollar (when you combine all the bonus categories), and you should be on the lookout for cards with 2% rewards rates. If you’re savvy on how you earn and use your rewards, you can push your earning rate even higher. You should also be able to find some plum deals for financing a balance transfer or a new purchase at 0%. While the average introductory period lasts for 12 months, you may qualify for introductory periods of 18 months or even longer. On top of rewards and 0% financing, your list of benefits should extend beyond the standard list of Mastercard or Visa benefits. Depending on the type of card and whether it charges an annual fee, you should expect to have a full list of travel and purchase protections, special perks such as concierge services and presale tickets for events, and for luxury cards, lounge access and hundreds of dollars in travel credits. You should qualify for the lowest interest rate on the card. "Lowest," of course, depends on the type of card. A true low interest card might start at 8% or 11%. Rewards cards, which tend to be pricier, start around 14%-16%. Here are two comparisons of seemingly similar credit cards that are both designed for people with excellent credit. However, once we break down the details on different spending categories and other features, one card in each comparison quickly rises to the top. When comparing two credit cards, look out for details like rewards rates, other hidden benefits, annual fee, intro and ongoing APRs, other fees, and more. We break down rewards comparisons below. FICO, the dominant scoring model, has found that the average consumer's score reached 704 in April 2018, the highest ever recorded. They also found that more people are scoring higher and fewer are scoring lower. Here is a breakdown of scores and the percentage of consumers who have captured them. FICO attributes much of this improvement on strong economic growth since the Great Recession. They've also found there is increased awareness of scores and credit building among consumers, who are on the hunt for ever-higher scores. Rewards and benefits abound for the consumer with excellent credit. Whether you are interested in a straightforward cash back card, an airline card or even a luxury card, rewards await you. Here are different types of cards that typically require excellent credit and the rewards they often offer. Cash back cards typically require good to excellent credit, or at least a score of 670. Rewards and benefits include cash back, 0% intro APR on purchases and balance transfers, and free FICO scores. Categories are usually for everyday purchases, such as restaurants, groceries and gas, although the cards with rotating categories may delve into purchases at Amazon.com, home improvement stores and wholesale clubs, such as the Discover it Cash Back. While some airline cards might accept good credit, some, such as British Airways Visa Signature, require excellent credit, which means your credit needs to start at 740. These cards typically have no foreign transaction fees, although there is likely an annual fee. It's flights that will get you the most miles, although some cards, such as the American Airlines AAdvantage MileUp Card, reward for everyday purchases such as groceries, gas and restaurants. While many hotel cards have annual fees of $89 and more, some offer no annual fee at all. Common benefits can include early check-in and late check-out; free breakfast for two; and free nights. Rewards are given for hotel stays, of course, but some cards also offer rewards for surprising categories. For example, the Hilton Honors American Express Ascend Card rewards users for purchases at U.S. supermarkets. General-purpose travel cards often have an annual fee, but you can find them without. These cards often come with no foreign transaction fees; no blackout dates or restrictions; and some offer credit for Global Entry or TSA Pre-Check. Common categories include travel, restaurants and hotel stays, such as the Venture Rewards or the Chase Sapphire Preferred. With annual fees in the hundreds of dollars, you may pause at getting a luxury rewards card, but these products offer superior access to airport lounges, 24/7 concierge service, upgrades and even gifts. For example, The Platinum Card from American Express offers an annual credit on Uber of up to $200, as well as an annual airline credit of $200. Finally, many business credit cards require excellent credit, making the bar higher for the business person who wants a product to augment her operation. Employee cards, travel benefits and more are featured with these cards. Categories can range from business-related purchases such as office supply stores and advertising to wireless and internet bills, or a flat rate. Freeze your credit reports. It's now free – and advisable – to freeze your 3 credit reports to ensure no one accesses them illegitimately. Pay multiple payments in a month. Since you won't know when your card issuers will send your information to the credit bureaus, it's a good idea to pay at least 2 times a month, even if you pay in full each month. That increases the likelihood that your balance will be low when the credit scoring models pull your information. Keep old debt on your credit reports. As tempting as it may be, Bankrate recommends that you avoid trying to get your old debt removed from your credit reports once they have been paid off. When you've paid the bill off, that actually benefits your credit. Apply for loans in a short amount of time. FICO scoring models only count up to 3 loan inquiries as one when they are made in a short period of time, as little as 14 days and as much as 45 days. This includes mortgages, student loans and auto loans but not credit cards. Consolidate balances. Credit expert John Ulzheimer notes that when you carry small balances, it's best to consolidate them "because you're penalized for having too many accounts with a balance. It's better to have fewer accounts with a balance than more accounts. So to the extent you can use fewer cards for the same purchases, the better you'll be." Plan out loans. Strategize several months out before taking out auto loans or mortgages so that you don't have large balances on your cards and you don't take out new cards. Follow the 20/10 Rule. Wells Fargo advises that you not let your card debt exceed more than 20% of your total yearly income after taxes, and that you not have more than 10% of your monthly take-home pay in credit card payments. Notify your bank of a move. Wells Fargo also advises that you make sure you notify your card issuers and other lenders of address or email changes so that you get your statement in a timely manner. Stay in touch with creditors. If you are late on a payment, or can't pay, reach out to your creditor and see what alternative payment plans they might offer, says Wells Fargo. What missteps do people with excellent credit make? By failing to put someone you trust on your card as an authorized user, you are missing out on rewards you can get through their spending. If you aren't reviewing what's on the market periodically, new rewards cards that suit your lifestyle may be passing you by. By keeping a card that doesn't serve your needs, like a card with an annual fee that you don't really use, you're not taking full advantage of your excellent credit. If it's an older card that you want to keep to continue to build your credit, you can ask for the annual fee to be waived, or you can ask for the card to be downgraded to a no annual fee card. There's nothing in the credit rule book that says mortgage payments or student loans are more important to your credit than card debt. Everything matters, and you need to be sure to pay everything on time, every time. One missed payment can quickly drop your score. Don't make sudden changes such as suddenly paying less or charging more, says Bankrate. That can indicate to your card issuer that you are having credit issues.